The bird of prey silver coins are exquisitely designed and struck with 99.99% pure silver. Weighing one ounce, they have a diameter of 38mm. The reverse side of the coins feature popular birds of prey, the first of which is the peregrine falcon designed by Emily Damstra, a natural science illustrator from North America. The Birds of Prey series celebrates the world’s best predators from the air. The coins resemble the grace and beauty of well-known birds of prey and the silver peregrine falcon is a fitting first edition to this highly collectible series. The Bird of Prey silver coin series is the latest edition of stunning collectible silver bullion to be produced by the world renowned Royal Canadian Mint. Featuring a fineness of 99.99% pure silver, these limited edition coins will only be minted in 2014 and 2015 and promise to be an attractive acquisition for coin collectors and long-term investors. The Royal Canadian Mint has announced only 1 million of each of its silver coin series featuring birds of prey will be minted. Stocks will therefore be limited so to ensure you do not miss out, we advise you to place your order at the earliest possible convenience. You can buy the bird of prey series from the CoinInvest website by selecting the coin of your choice from the table above to take you through to the product description page where you can learn more about the individual coins. To make a purchase sign into your account, indicate how many coins you want to buy and add to your shopping cart by clicking on the orange band in the volume pricing table. In 2014, the Royal Canadian Mint announced its intention to mint special edition silver coins featuring well known birds of prey. The exciting new series kicks off with the Peregrine Falcon one ounce silver coin, struck with .9999 purity and fashioned with an impeccable design. Only four coins will be produced in the Birds of Prey series, two in 2014 and two in 2015. The limited edition series builds on the early success of the Canadian Wildlife gold bullion which was also introduced in 2014 featuring the “Howling Wolf”. An awe-inspiring hunter, the peregrine falcon is one of the best-known of all birds of prey and is often seen hovering over fields and rivers waiting to pounce on field mice and waterfowl. Because of its incredible hunting technique and ferociousness the falcon has been used as a symbol of military aggression since the Middle Ages and can be found in the coat of arms of European nobility in England and France. In ancient times, it was considered the peregrine falcon carried messengers between humans and the spirit world. It is therefore often found carved into the totem poles of Native American Indians, but was also prevalent in Europe, China and most notably Egypt. The Egyptians considered the falcon, King of the Birds and is a powerful animal guide symbolising the rising sun. 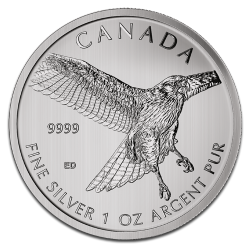 For the protection of investors, the Royal Canadian Mint only issue coins in the bird of prey series to licensed bullion dealers and do not sell them directly to members of the public. Given the limited numbers and one-off collectible series, the bird of prey silver coins promise to be a sound investment and a special gift. The country of origin is written across the top and along the rim are the words: FINE SILVER 1 OZ ARGENT PUR meaning pure silver in French. The numbers .9999 engraved to the left of the bird represent the coins silver purity. The obverse has the familiar profile of Queen Elizabeth II rendered by artist Susanna Blunt, a portrait artist from Canada. The inscription ELIZABETH II rolls around the upper rim whilst 5 DOLLARS 2014 is featured along the lower rim. The Royal Canadian Mint is revered all over the world for its quality and artistry of gold and silver bullion. Ever the innovators, there are few other mints that can match the high-level of production or consistently manufacture products with the highest purity of precious metal content. Indeed, the Canadian Mint is one of the world’s most technically advanced refineries and use the latest techniques to produce over one billion circulation coins a year. Yielding their precious metals from a number of reputable sources, the Royal Mint incorporate eco-friendly procedures and integrate raw materials in order to deliver the finest of refined products. Coins produced by the Royal Canadian Mint are struck to the highest quality of bullion manufacturing using the latest in “Bullion DNA” Anti-Counterfeiting Technology. For the safety of investors, a unique security mark is engraved on to every die before being struck on the coins. The coins are then registered using Digital Non-destructive Activation technology that encodes and stores the images in a secure database. Coins issued by the Royal Mint are only despatched directly to licensed bullion dealers. If you wish to sell any of the coins in the birds of prey series, CoinInvest GmbH are interested to hear from you. As one of the leading bullion dealers in Europe, we offer highly competitive rates based on the latest market prices. To sell your birds of prey silver coins contact a member of our friendly staff who will be happy to prepare a proposal and confirm the same via email.